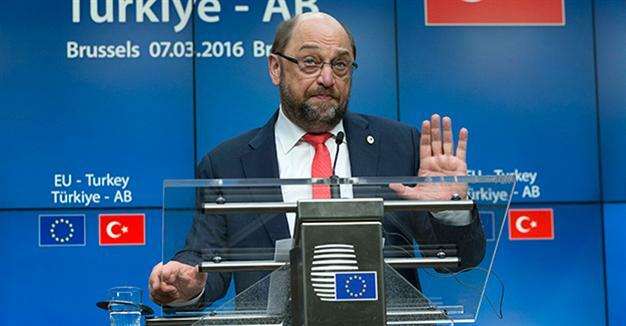 Martin Schulz, the president of the European Parliament (EP), harshly criticized the detention of a number of Cumhuriyet daily journalists, including the paper’s editor-in-chief, on Monday, saying that the detentions are yet another red line crossed against freedom of expression in Turkey. “Cumhuriyetgzt isn’t just any other independent newspaper: it’s the oldest secular newspaper in the country, an institution of the Republic,” Schulz wrote from his Twitter account on Monday. Detention warrants were issued for 18 journalists from the daily, and police began to take the journalists into custody one by one on Monday morning. Thirteen journalists including the daily’s editor-in-chief, Murat Sabuncu, have been detained so far. The Cumhuriyet daily is facing an investigation over charges of helping the terrorist Kurdistan Workers’ Party (PKK) and FETÖ. FETÖ, meaning Fethullahist Terror Organization, is a derogatory term and acronym coined by President Recep Tayyip Erdoğan and the Justice and Development Party (AK Party) government to refer to the faith-based Gülen movement. Erdoğan and the AK Party accuse the movement of masterminding a failed coup attempt on July 15. The movement strongly denies any involvement. Dozens of media outlets in the country have been closed down and scores of journalists have been jailed by the government since the putsch. According to a recent report from the Contemporary Journalists Association (ÇGD), 118 media outlets in Turkey were closed down, 184 journalists were detained, 56 journalists arrested, 866 journalists fired from their jobs and 620 journalists had their press cards cancelled during the July-September period. “Debate on death penalty, detaining unaligned mayors, appointing university staff: polarisation rather than unity is what TK [Turkish] gov’t is after,” wrote Schulz in another mesage from his Twitter account, referring to controversial practices of the Turkish government in the aftermath of the coup attempt. This article originally appeared in Turkish Minute on October 31.